We all have been in a place where we find ourselves among new surroundings and new faces, all while being accepted in a new group. Plus, on top of that, maybe we’re starting to train for the first time in awhile, or trying to keep up, all at the same time. We know it’s a very daunting feeling and we also know that feeling great in our gym will make us perform better, giving us a relaxed place where we can learn and share with others. Talk to our coach. He works very hard to keep things moving. He is our anchor and our mentor, the one who knows everything that’s happening in our gym and is always open and welcoming you for any kind of concern, anything technical such as a how to scale a movement, increase mobility or any special health requirement that you might have, or even any geeky question you might have. Get to know those around you. We all know that awkward feeling of stepping into an unknown space full of strangers (crickets’ sound on the background)… so it’s a good idea to show your best friendly smile and present yourself. You’ll find they will be very welcoming, greet you by your name and cheer for you even if they have never met you before. Never assume, just ask. The coach is not the only ‘knows-it-all’ person during a class and because CrossFit is all about community and doing things together, the other participants around you might have an awesome knowledge of it because they are passionate, breath and live CrossFit all day long (even if it’s just showing you where the skip rope are). Just ask! Put your cheer on. There’s some incredible magic that happens inside a CrossFit gym’s atmosphere both during and at the end of a workout. We check on the other athletes and high five each other (even if we didn’t finish the workout). Don’t be shy and encourage those around you whenever you can. That shows we understand and respect our fellow athletes, and want to see those around us succeed! Keep it up outside the class. It doesn’t have to end when we leave the gym. CrossFit is a lifestyle we cultivate, chat and care about. Engage with your peers for a stretch after class, celebrate a birthday or any special occasion and follow the gym’s Facebook page so you can involve yourself in the conversation. Before you know it, you would find yourself at home, happy to train and ready to come back for more the next day! See? It’s pretty easy! 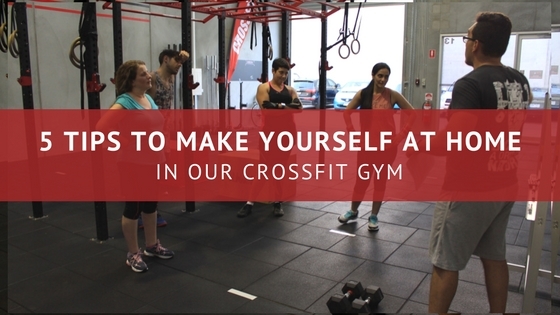 If you want to experience it by itself drop by our gym for a free session and find how welcoming a CrossFit gym can be for the newcomer. Marlin Paz has been doing CrossFit for two years now. She loves dancing, and enjoys cooking healthy food as much as eating it!